When the weather heats up, thoughts turn to chilling out. If central air conditioning isn’t an option, room air conditioners can be an inexpensive and energy-efficient alternative for cooling one or two rooms. Central air conditioners are not always the best option when it comes to cooling your home. They are expensive to operate and very expensive to install. In older homes without central air, window units can be a practical and cost effective solution. Fans are a low cost option but only circulate the air rather than cooling the air and in hotter environments will not be sufficient to keep you cool during the long and hot summer days. Window air conditioning units are the perfect middle ground. They are cost effective, they take hot air and make it cold, and can maintain a cooler temperature for one or two rooms. Energy Star estimates that the cost of cooling a home represents 13% of the average household budget. This explains why 6.5 million window air conditioner units are sold each year. Choosing the right one can keep energy costs down. They provide enough energy to cool a room, save you the cost of a central unit, regardless of which rooms are primarily used. Single window units are popular choices when a smaller area needs to be cooled. Storage buildings or workshops that only require cooling small square footage are perfect for window AC units. In northern climates, where the summers are not as hot, or areas where crosswinds provide a constant breeze can also benefit from window air units. Regardless of what space you need to cool, you want a unit that will last, be energy efficient, keeping costs down, and with the features that will make the unit convenient and the room comfortable. The Frigidaire FFRE0833S1 8,000 BTU 115V is the top pick because it offers enough power to cool a large room and the features required to improve your comfort. This window unit offers 8000 BTUs of power which is enough to maintain a cool temperature in a 350 square foot room during the hottest day of the year. Included with the cooling mechanism is a dehumidifier, which takes the moisture out of the air, improving your comfort. The dehumidifier is able to take up to 1.7 pints of moisture out of the air per hour. In the south east where humidity is a relevant issue, this feature alone is very valuable. Those who suffer from allergies will also appreciate the ionizer which purifies the air and removes impurities. You will have clean dry air and a cool room combining three devices in one. The compact design only weighs 47 pounds and fits comfortably in any double hung window. The dimensions are 15.5 X 18.5 X 13.4. The unit operates very quietly compared to competitor models with the same amount of power, making it perfect for either living or bedroom applications. It is energy efficient and features a low power start which prevents power surges and saves power. It has an energy star rating of 11.3 and only costs $64 per year to operate. You are able to set the exact temperature you want for the room, based on your comfort preferences. The Frigidaire FFRE0833Q1 operates on a set temperature rather than high and low settings. A remote control is included so changing settings is easy and convenient. The unit draws 6.2 amps, uses 590 watts of power, and comes with insulation foam to seal the window from air leaks. The Frigidaire FFRE0833Q1 comes with a 5 year warranty. 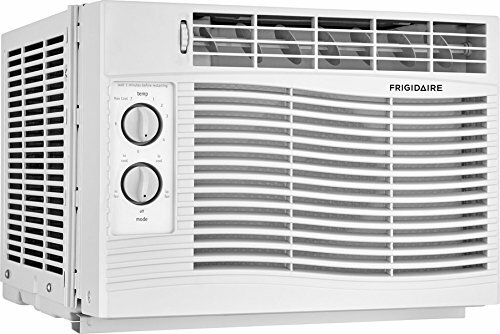 The Frigidaire FFRA0811R1 8000 BTU 115-volt Window-Mounted Compact Air Conditioner with Remote Control is a top pick because of its power and efficiency. This unit features 8,000 BTUs and can cool a space up to 350 square feet or a large room. It comes with an efficiency rating of 10.9 and only costs $83 dollars to operate each year. It includes a window mounting kit and operates with a standard plug. The temperature settings can be controlled to the exact degree and there is an easy to read LED screen that helps you monitor the room temperature. The unit only weighs 60 pounds and is very compact at 21.5 X 19 X 14 inches. The Frigidaire FFRA0811R1 features a built in dehumidifier, which can accommodate up to 1.7 pints of moisture per hour giving you a cool dry space to enjoy. The controls feature a timer that works for up to 24 hours and a remote control that allows you to operate the unit remotely. Both temperature and fan speeds can be controlled with the remote. It offers different modes that will adjust the cooling based on your needs. These include an auto mode, energy saver, and sleep mode. The operations are quiet enough to be used in a bedroom and powerful enough to be used in living or cooking quarters. There is a fresh air vent and control over the exhaust. Air flow can be directed with 8 way adjustments. The mesh filer is washable, which save you on replacement filter costs and still cleans impurities out of the air. 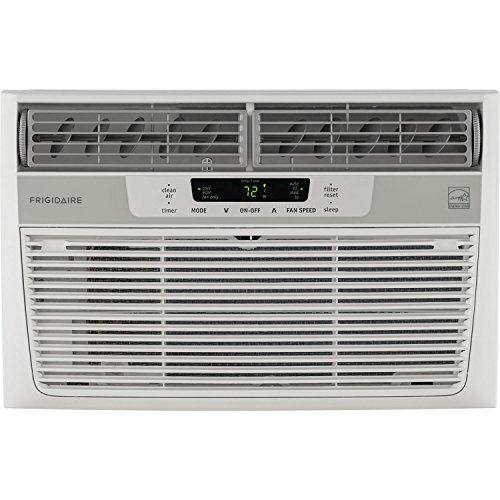 The Frigidaire FFRA0511U1 5, 000 BTU 115V Window-Mounted Mini-Compact Air Conditioner with Mechanical Controls is a top pick because it runs quietly and offers a dehumidifier at a low price point. This 5000 BTU air conditioner is a basic low cost investment and low cost operations. It is able to cool a room up to 150 feet comfortably and plugs into a standard outlet. The unit’s dehumidifier will extract up to 1.1 pints of moisture per hour leaving you with a cooler room faster. There are two speed controls and two fan speeds and the air flow can be adjusted in two different directions. As an energy saving feature the Frigidaire FFRA0511U1 offers a low power startup which conserves energy and saves you money on the electric usage. The efficiency ratio is 11.1. The unit sits comfortably in a double hung window and incudes a mounting kit. It does not adjust the temperature by specific degrees, however it does have six different temperature ratings which can be adjusted to meet your comfort level. The unit is estimated to cost $41 dollars per year to operate, making it very cost effective. The unit weighs 41 pounds and is very compact at only 15 X 16 X 12 in size. It operates quietly and could be a good choice for living or sleeping spaces. The filter is washable, saving you money on replacements. The Frigidaire models swept our top picks because the brand dominates the home window air conditioning space. The one you choose will be based on the size of the room you need to cool and the features that matter most. The top pick is the Frigidaire FFRE0833S1 because it is the most versatile and meets the needs of the average room. It contains both a dehumidifier and an air purifier, which gives you the best of both worlds. This unit also has specific digital temperature controls and a remote control. The Frigidaire FFRA0811R1 is the most powerful unit and cools up to 450 square feet with both a temperature control and a remote. It has a dehumidifier but not an air purifier. If you are cooling a larger room and do not suffer from allergies this is the best choice. The Frigidaire FFRA0511U1 is the most economical unit and the most basic with regard to features. Instead of digital controls it offers 6 speeds settings and two fan speed settings so you are able to have a comfortable room, although you cannot operate the unit with a remote control. It does off a dehumidifier and a washable filter. This unit only costs 41 dollars per year to run so it is economical to buy and operate. This is the best selection is you are cooling a small space without the need for bells and whistles. When looking for a window air conditioning unit there are a number of factors which will determine which is the best window air conditioner for your needs. Where will the unit be placed? Not all windows are built to hold a window unit. The window must open easily and be able to secure the unit in place. Most window units are designed to be placed in double hung windows. There should be a way to seal leaks so the hot air is not coming into the room and the cold air going out. The sill or bottom of the window needs to be strong enough to hold the weight of the unit. Placing the unit in the center of the room will provide the most even cooling. What square footage must be cooled? This will largely determine the size of the unit you will need or BTUs. A window unit blows air forward and cools the space. Doorways and other structures may make it difficult to cool more than one room. If you choose a unit that is too large it could cool the space too fast that the moisture is not removed leaving you with a cold and muggy room. If it is too small the room will not stay adequately cooled. What is your budget? Air conditioners can run from $200 to over $1000 depending on the BTUs it produces, the amount of space you need cooled, and the number of features you want. Your budget and cooling needs will help you decide what is the best and most cost effective strategy for the space you need to cool. What size unit do you need? Most window air conditioning units range from 5000 to 12,500 BTUs (British Thermal Units). Typically, you want to get 20 BTUs for each square foot of space that needs to be cooled. Other considerations will include how high the ceilings are and where the unit will be placed. Blinds or light blocking curtains can save you energy and make the room easier to cool. A room that gets lots of sun and active living spaces like a living room or kitchen will be harder to cool and require higher BTUs to be effective. For example, if you want to place the unit in a kitchen, Energy Star recommends adding 4,000 BTU to the square footage number to account for the heat produced by kitchen appliances. How loud with the unit be? The sound of a running fan may not be an issue if you are in a kitchen or living room where activity is happening and the noise blends in. If it is in a bedroom and you are a light sleeper, a noisy air conditioner could impact your ability to sleep. Location and application will determine how important the noise factor is. All window air conditioners will have some level of noise but there is a wide range of sound levels which are measured in decibels, depending on the unit you select. What direction of air flow does the unit have? Some units just blow air straight ahead while others allow you to direct the air flow to the left and right. 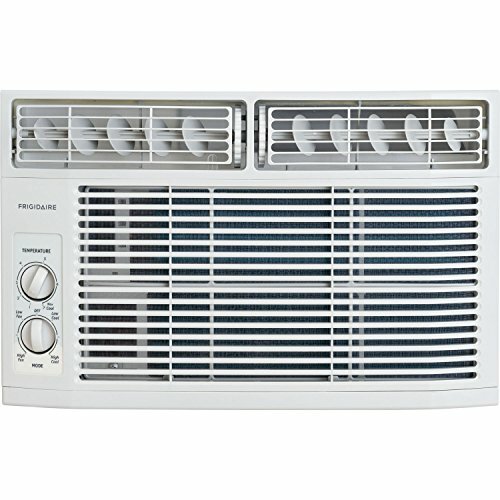 Depending on the room and the location of the unit you may want to redirect the air to cool the room most efficiently. A unit that offers the ability to change the air flow will be more versatile and do a better job of cooling any room. Install the air conditioner correctly. If you do not have double hung windows you may be able to place the unit as a through the wall unit, but that would need to be customized. If the unit will be the primary source of air and will be permanent, this may be worth the added installation costs. Most window air conditioners can be personally installed. During installation ensure it is level in order for proper drainage. Water will drip from the unit and you want the drip to be outside the house or building. If it drips too close to the structure and does not drain properly, the water could get inside or cause damage to the home. It should also be placed away from other electrical devices such as electronics or lamps. Ensure it is installed in a way that the filter is easy to change. Automation is becoming more common and many units include remote controls, control through your smart phone, or other automation that makes it easy to turn the unit on and off or control the temperature. Window air conditioners can be a great way to cool a space. Whether you only need to cool a room, there is a room in your home that is more difficult to cool, or you have a dedicated space like a workshop that needs temperature controls in the summer. Individual window units are inexpensive and easy to install. They are cheaper to operate than a central unit and can provide comfort economically.